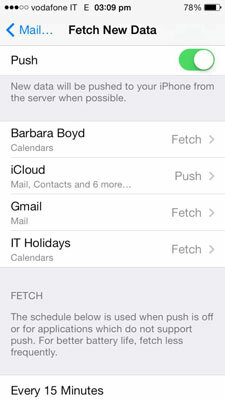 Going to the Mail, Contacts, Calendars screen on your iPhone, you see a button called Fetch New Data. Think of the Mail app as the dog and your incoming e-mail messages as the ball. The mail server throws — the terminology is pushes — your messages, and iPhone fetches — or downloads — them. Alternatively, the messages are on the server and Mail goes and fetches them when told. Once again, you have the option of turning Fetch and Push on or off. Tap Settings→Mail, Contacts, Calendars→Fetch New Data. Turn on Push, and new data is pushed to your iPhone from the server. Whether Mail is open or not, messages arrive in real-time in your mailbox and you hear an audible alert as they arrive, if you’ve established one. Set Push or Fetch for each account; tap the name of an account. A screen opens with the schedule options available. iCloud also lets you assign Push to specific mailboxes, such as Inbox or Drafts and the others remain Fetch. Tap the option you want. Push: To automatically retrieve new messages as they arrive in your inbox on the server. Fetch: To check for messages at the interval you previously established. Manual: To check for messages only when you open the Mail app or when you drag down below the status bar to refresh your inbox. Choose a frequency for Fetch by scrolling down to see your options. If you turn Push off or use an application that doesn’t support Push, your iPhone automatically downloads messages at the frequency you chose.